Shakerag Manor in Johns Creek is down to the final 4 homes. We have 2 move-in ready homes and 2 opportunities to build your dream home. The homes in Shakerag Manor are located in the highly sought after Johns Creek area priced from $800 hundred thousand. There are 10 estate lots ranging in size from 1 to almost 5 acres. Each homesite has been designed to take advantage of the natural terrain featuring deep setbacks and wide spacing between neighboring homes for privacy. There is paddock fencing, stone columns, gentle berming at the neighborhood road frontage and PRIVATE LEVEL BACKYARDS. Johns Creek is known as one of the best places to live in the Country. Children would attend some of the best schools in the state which include: Northview High School, River Trail Middle School, and Shakerag Elementary School. Shakerag Manor is just minutes from major roads, employment centers and amenities. Two opportunities to build your dream home and two homes are move-in ready. Large spacious wooded homesites within walking distance to parks and school. Homesite 5 is located on 1.69 acres. The home is 5 bedrooms, 5.5 bathrooms, and priced at $969,900 & offering a Custom Closet promotion this month! This home contains natural gas products which is an advantage to our homebuyers. Natural gas is American, abundant and affordable! It’s efficient, and the best energy choice for your family and the environment. This home include natural gas heating, gas water heater, and one gas fireplace. The homeowner will be able to select their gas cooktop and other appliances. Some of the other highlights of this home include: a gourmet kitchen with butlers pantry, granite countertops, tile back splash, stainless steel appliances, and custom wood cabinets with soft close drawers & doors. The owners suite is on the second level and 3 other large secondary bedrooms all with private bathrooms. There is a guest room on the main level with a private bathroom. The large level homesite even allows space for a pool. The other move-in ready home is priced at $898,900 and located on 1.37 acres. If you choose to build on one of our other two homesites, we offer 9 different floor plans with a variety of elevations, both owner suite up and on the main level, featuring 4 sides brick, stone and cedar shake. The homes include 3 car garages, 4 sides sod and irrigation and some have basements. Square footage is from 3,400 hundred to over 5,000 thousand . 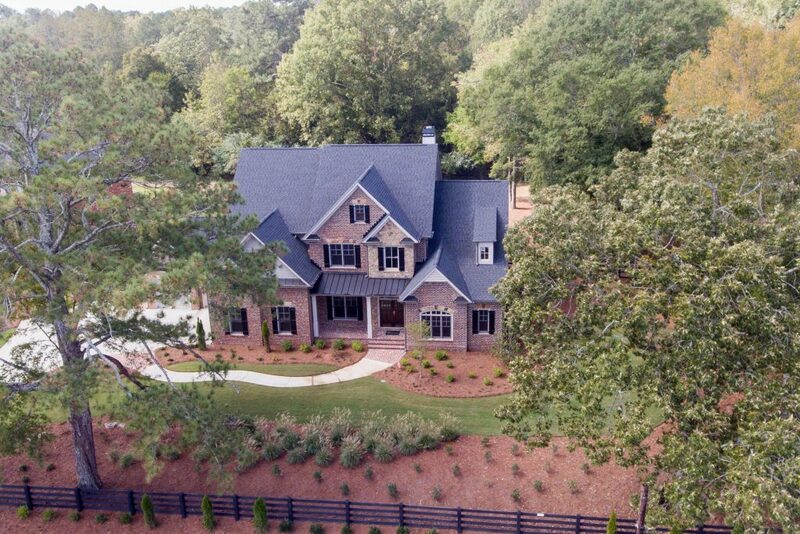 Peachtree Residential will customize each home we build to our customer’s specific needs and requests. Visit us today to learn more about our luxury homes. The homes are available to view on lockbox, Enter Now or by appointment. Come see the Peachtree Residential difference and all that Shakerag Manor has to offer. As featured on Atlanta’s Best New Homes FOX TV, Saturday, 9:30am. Watch here!